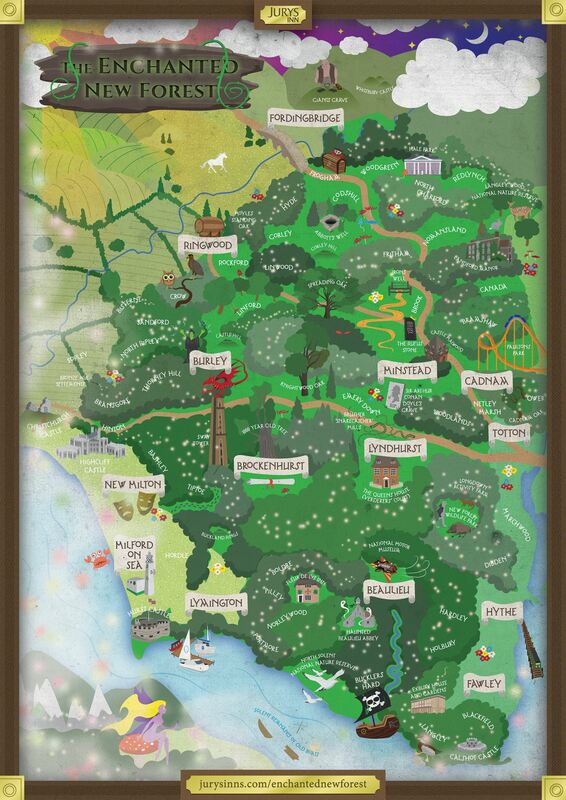 Explore the New Forest in a new and exciting way, with this fairyland style map. Please see the guide below for more information on historical landmarks, quaint villages, surrounding market towns and other attractions that the New Forest has to offer. Feel free to use the infographic above on your website by using the following embed code. Please make sure to keep the source attribution to Jurys Inn. 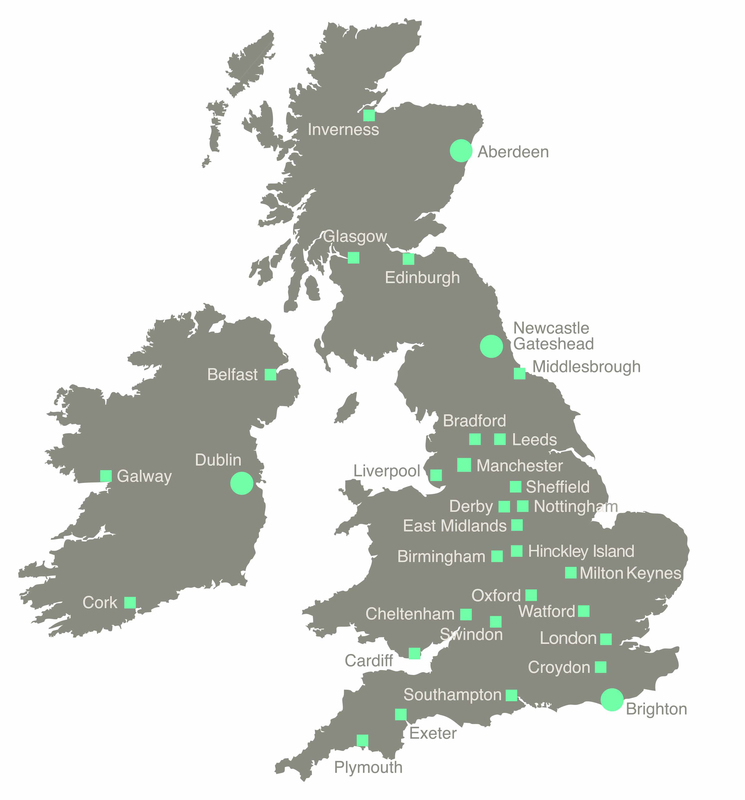 Take a look at our map guide below for more detail about some of places featured on the map, and if you’re visiting the New Forest from anywhere else in the world and are in need of accommodation – feel free to book a room at our Southampton hotel which is right in the city centre, and just 10 minutes’ drive from the Forest edge. Ringwood is a fun little market town steeped in history and locally loved for its surrounding forestry where children can build bases, forts, rope swings over streams, and become adventurers, explorers, outlaws or pirates. With a weekly market that dates back to the middle ages, its very own Brewery, country walks along the River Avon, and the Liberty's Owl Raptor & Reptile Centre, Ringwood is bursting with enchanting country charm. Quaint, picturesque and a little magical, Beaulieu is a New Forest village overflowing with Georgian cottages, country sweet shops, and natural beauty. Beaulieu’s iconic Motor Museum houses the magical flying car Chitty Chitty Bang Bang (among a host historic motors), Beaulieu Abbey is home to ghosts that have been haunting for over a hundred years, and the Gothic Palace House offers an exciting glimpse into this town’s rich history. Nestled in the New Forest, Burley is a quintessential country village that oozes charm and enchantments. With wildlife roaming freely and legends of dragons, witches and smugglers, Burley is truly unique in character. Explore witchcraft stores, tuck into a Burley ice cream, peruse traditional sweet stores, sample handmade fudge that melts in your mouth, or simply go on a New Forest adventure, disappearing into Burley’s magical world. Situated on the banks of the River Avon, Fordingbridge is draped in riverside beauty with riverbank willows and greenery. Known for its elegant seven arched bridge, hidden memorial gardens, and historic St. Mary’s Church, this town is both picturesque and traditional. The resting place of Sir Arthur Conan Doyle (writer of Sherlock Holmes), Minstead is a tiny hamlet dating back to prehistoric times that today offers just a village shop, hall, church (All Saints), and pub (The Trusty Servant). Surrounded by woodlands, heathlands, a valley bog and an array of wildlife, Minstead is a tranquil haven. A larger village and coined the ‘Capital’ of the New Forest, Lyndhurst is a bustling centre of independent stores, art galleries, museums, tea rooms, traditional pubs, and more. The New Forest Museum offers a peek into the forest’s history and heritage, while the beautiful Pre-Raphaelite church of St Michael and All Angels overlooks the village and is the resting place of Alice Liddell who inspired Lewis Carroll’s ‘Alice in Wonderland’. Situated on the southern edge of the New Forest, Lymington is an exquisite coastal market town boasting Georgian architecture, cobblestone streets, two marinas, and independent boutiques. The north of the town is boarded with the luscious greenery of the New Forest with stretches of woodlands and heathlands, while south of Lymington affords beautiful views of the Solent. Boasting remains from Stone Age and Roman occupation, Fawley is a historical village on the western shore of the Solent. The beautiful All Saints Church dates back to 1170. A coastal New Forest town, Hythe offers seafront beauty, a Victorian pier, and the oldest working pier train in the world. Overflowing with maritime history and heritage, Hythe is the perfect blend of charming seaside town and New Forest delights. Dating back to the medieval period, Cadnam is an important crossroad village between Southampton, Bournemouth, and Poole. The village is known for its ‘Cadnam Oak’, which, as legend goes, became leafy green on Christmas Day, having been leafless the day before, and leafless again the day after! The current Cadnam Oak is a descendent of the original, but continues to carry the fame nonetheless. A large village situated on the shore of the Solent, Milford-on-Sea is a New Forest treasure. The coastline and beach afford views of the Isle of Wight during the day, and on a clear night, Christchurch, Bournemouth and Poole can all be seen. Along with the many characterful shops, cafés and pubs, the beaches and cliff-top path ensures that there is plenty of exciting things to discover and enjoy. A tiny village situated on the banks of the Beaulieu River, Buckler’s Hard is steeped in maritime history. Once a shipbuilding hub in the 18th century for Nelson’s Navy, the Maritime museum and Buckler’s Hard Story takes you on a journey of the town’s heritage in wartime vessels. In true New Forest charm, the apple orchard that houses the ingredients (apples) for Beaulieu Apple juice is also available to visit. Famed for the New Forest’s ‘Snakecatcher’, Emery Down is home to a unique story. Brusher Mills (1840-1903), aka ‘The Snakecatcher’, is a folk hero who made a living from snake catching, supposedly turning up to local properties with just a sack and a forked stick. He is said to have used the snakes for manufacturing and selling ointments for bites and ailments, sold their skeletons to tourists, and supplied grass snakes to London Zoo to feed other snakes and birds of prey. Mills became a bit of a New Forest tourist attraction, and supposedly, visitors sought him out to listen to his wisdom and country lore. Today, you can visit his grave at St. Nicholas. Covering 820 hectares of the New Forest, the North Solent Nature Reserve offers a plethora of habitats to explore, varying from coastal and woodland to reedbeds and lagoons. The ancient oak woods are perfect for young explorers to enter into a magical world of nymphs, witches and mythical creatures. The wide range of habitats also offer a diverse collection of wildlife for adventurers and animal lovers to discover and observe. Situated in the north of the New Forest, Langley Wood National Nature Reserve offers 216 hectares of lush greenery consisting of ancient broadleaved woodlands with pedunculate and sessile oak. There’s a myriad of wildlife to see, including deer, and plenty of forest to explore along the footpaths and off-trail. The New Forest Wildlife Park offers an enchanting adventure with an array of animals to discover and learn about, from the Grey Wolf to the Eurasian Lynx. The wildlife park also runs ‘animal close encounters’ sessions, perfect for children to immerse and engage with the animals. A unique New Forest attraction, the Rufus Stone marks the alleged spot where William II was fatally wounded. Son of William I, who founded the New Forest for royal hunting, William II was nicknamed William Rufus and was considered quite an unpopular monarch. His death was accidental (although circumstances were murky) when supposedly an arrow deflected off a tree, hitting the king in the chest. Today, the Rufus Stone stands in the spot of the original oak tree that deflected the arrow, offering a piece of New Forest history. An exciting New Forest treasure, Hurst Castle provides a historical adventure like no other. Sitting on a shingle spit, the castle was an advanced artillery fortress built by Henry VIII and was later used as a prison for 17th Century captives. Its unique location and heritage makes this castle perfect for children (and parents) to enter into a magical world of medieval adventures, transforming into knights and princesses who tackle dragons and fight in sieges. Amongst the wildlife of the New Forest sits the Longdown Activity Farm bursting with farmyard animals, ponies and play areas (including a trampoline barn). The farm offers an exciting exploration for children to learn, engage, and immerse. A family adventure, Paultons Park offers a plethora of rides, attractions and even 4D (Sherlock Holmes!) films. Nestled next to Cadnam River in the North East of the New Forest, Paultons provides an enchanting experience.